The idea is fascinating and laudable. Big blows to all those Amway touts of their false and lucrative propaganda, who boast the benefit of the chain marketing by having a car (do you read: a car) , to ride in just matter of few days, if not hours of efforts. Thanks to Ratan Tata. That's how we used to associate a car as a big status coup and achievement of sort to have one in your garage, not long back. Mr.Tata after seeing a small family getting drenched due to seasonal rain and realizing the culprit of this is the non-availability of a car or rather non-affordability of one, decided to build one such stuff which would be affordable to the common mass and precisely to all those who gets drenched day-in and day-out. Hence he rushed back to his office and get hold off all his able designers and within days announced the world of manufacturing a car that would cost no more than 1 Lakh, pop, including everything. Everyone was happy of the news: a part for the revolutionary idea and a part for being able to have one so called car in future of their own. As being a gentleman and far from lacking the quality of a politician of promising and forgetting, Mr.Tata did started giving his vision some realty. Hence the small car Nano started to take some shape. But as every gentleman does, he did a mistake when he decided to have the plant for this baby at Singur, in West Bengal. Thanks to all those politicians of Left and Trinamool, who left no stones unturned in making the state a Waste Bengla get to the act with their tricks which they are pioneer at. So usual Hartal & Dharna followed leaving Mr.Tata frustrated and searching for some other options. Who lost more? The Nano or the chaps of Singur and West Bengal at large? NaMo promptly seized the opportunity and as per him invested only Rs1/- in messaging Mr.Tata about the availability of few acers of land in Gujurat for the plant. After a prolonged wait the Nano did hit the road and buyers (All those drenched) lining up for the booking. Few lucky ones who did managed to get the booking through and no sooner found the little beast in their garage or make shift garage. I even thought of getting my hands on one of those babies, but somehow couldn't managed to get my booking through. If somebody asks me how I feel about my failure in getting the booking done then the answer would be: I am happy, if not ecstatic. Happy not because I somehow saved 1 Lakh, but because I din't have to see 1 Lakh of my hard earned money getting gutted in the middle of the road. I know one certain Mr.Chawla, who used to get drenched every now-and-then but off late never. Thanks to Nano and Mr.Tata. The Chawla family was happy as hell with their latest asset. Roaming around Delhi with their new found baby, all those Golgappes, Karim's Tandoori Chickens, Famous Chandni Chowk Kulfi. All in one making the small car a mobile restaurant, and keep it in mind without getting drenched ever. All was well till one day while having the Tikha Golgappa, somewhere in East Delhi. All those rushing fire brigade vans didn't make much worry for the Chawla family, as a fire or two on weekly basis was quite common in the market place. Thanks to Sarkar for banning smoking at public places. These fire station guys can breath a little easy. Still with the taste of the Pudina on their lips when the Chawalas gathered at the parking lot, only to find all those red vans were actually rushing for their rescue. Where the heck is our baby? All left is a heap of burning mass along with the small Tweety they have fondly hanged on the rear view mirror. Chawlas are not the only one to be at the receiving end of some technical mistake of the car. One such drenched guy in Surat had to go through the same ordeal, only too early. No sooner after getting out of the showroom, as per rituals he stopped by a Mandir to do the Puja. While he was negotiating the price of the Nariyal, he saw two of his friends who were still sited on the car running for their lives. 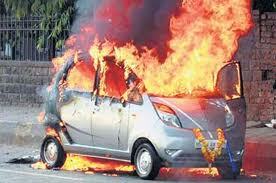 Gee, his new car is on flames and the near by Dhokla wala is also running for his life. Miffed by the torture to Chawlas and that unknown Indian of Surat, Tatas are revisiting their design all over again. Few insiders claim if this fire has to stop then the car cost might go a bit up. This is what I meant, when I said I was happy not to see 1 lakh of mine getting gutted in the middle of the road. Fire or No fire, I still believe the whole idea is a revolutionary one. As somebody famously said, Ideas, don't die or you can't burn the ideas, coz Ideas are bulletproof as well as fire proof. Hopefully the Tatas are working on the flaw and I would wait for sometime to see if any more of these babies getting burned on the middle of the road before I try my luck on the booking counter again.